It feels like aeons since it was announced, but it looks like Binding of Isaac: Rebirth will be ready to play soon. The above video is the first substantial look we've had of the remake, aside from a bunch of teasingly brief animated gifs and offscreen captures. According to creator Edmund McMillen writing on his blog , the round worm depicted in the footage above will replace the Parabite early in the game. McMillen also recently revealed a new item in the form of The Starter Deck, as well as news that each item will now have a description, albeit a cryptic one. "At this point there are twice as many items in the game as before and I think it's pretty illogical for me to expect players to remember them all," McMillen wrote . "I think the added info will hint at what items do before they are used and possibly spark their memories if they find them again in another play through." 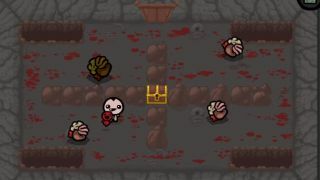 The Binding of Isaac: Rebirth will also allow users to share game seeds , meaning especially interesting and / or challenging runs can be revisited.